This question is the first thing crooned by vocalist-and-guitarist Stian Økland on Seven Impale‘s sophomore album, Contrapasso. It was also the question burning in my mind after several months of listening to their debut album, City of the Sun, which was my favorite record of 2014. I’ve heard plenty of bands with elements of both jazz and prog rock, but never one that truly synthesizes those styles in perfect balance. Typically you can feel whether a band is rooted in jazz and incorporating some elements of prog or vice versa. With this Norwegian sextet, such a distinction is impossible; they are exactly, as their facebook puts it, “progressive jazzrock”. They exemplify this sound on the five tracks of City of the Sun, presenting themselves as some glorious hybrid of King Crimson, The Mars Volta, and Jaga Jazzist. But we can all name bands that launched themselves onto the scene with an incredibly promising debut, only to faceplant with a disastrous follow-up that stripped away whatever made them good to begin with. So where would Seven Impale go? Play it safe and offer more of the same? Not the worst idea, since they had crafted an excellent and unique sound already. Go 4/4 and become the prog world’s version of Kenny G? Unlikely, though not impossible. Or would they keep their roots but also work in some new angles? Could they do this without compromising their identity, or ending up just another one-album wonder? I am thrilled to report that Seven Impale have not only avoided the sophomore slump, they have indeed expanded their sonic palette and incorporated a remarkable number of new elements without losing their established identity. Contrapasso is often downright surprising in the directions it chooses to take, and yet never feels like a completely different band from their debut. In fact, they make an explicit point of reminding listeners where they came from, with musical callbacks to the final track of City of the Sun, ‘God Left Us for a Black-Dressed Woman’, in both the interlude ‘Ascension’ and the opening overture of first track ‘Lemma’. This track is worth spending some serious time with, so I’ll come back to it a little later. 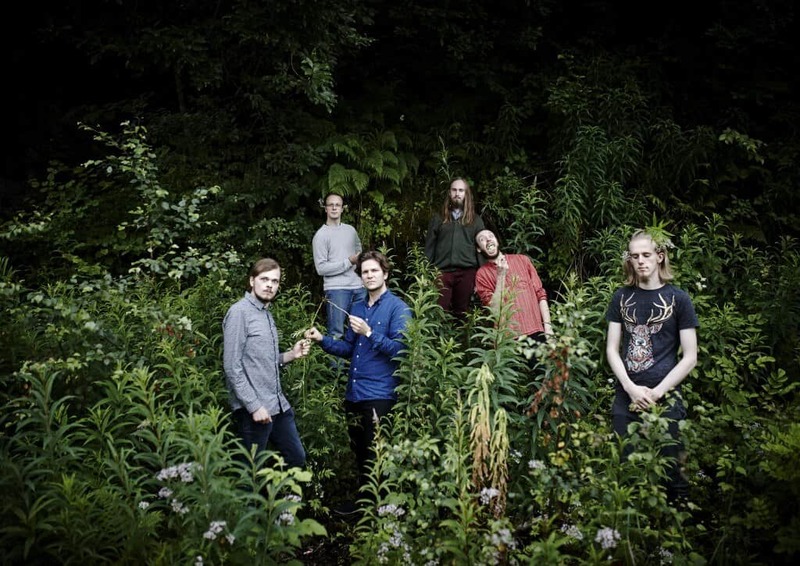 I got to chat with Seven Impale’s saxophonist, Benjamin Widerøe, about Contrapasso and the band’s evolution since City of the Sun. He told me that the previous album was a collection of songs they had been playing for a while, whereas the new album was much fresher, and was indeed not entirely finished when they started recording it: “We had made the structure of the songs, and most melodies were finished, but the songs didn’t reach their ‘final form’ until we worked on them in the studio.” There is an enhanced unity on the album, in terms of structure and sequencing as well as the band working better together as a result of two years’ more experience and bonding. The capabilities of this tighter group are reflected brilliantly in both quality and quantity on this work – the nine tracks comprise more than an hour, but more than justify the listener’s time investment. When you press play, you will be immediately met with an angular riff that grounds the band in the sound you’re familiar with if you know their first album. This is not coincidence either – I’m embarrassed to say that Benjamin had to point out to me that this riff is in fact directly adapted from the ending of ‘God Left Us for a Black-Dressed Woman’, in order to consciously establish continuity between the two albums. This is a wise move, because the old skin is quickly shed; after no more than 20 seconds, the band shifts to a trippy, psychedelic variation on this riff driven by bass and pulsing organ beneath spaced-out swirls of vocal snippets, almost like Seven Impale as covered by Mammatus or Acid Mothers Temple. When the main vocals kick in, they are in a baritone register that’s not like anything we’ve heard from the band before; this is followed by a chaotic sax solo, and within minutes we are acutely aware that we are far removed from the world of City of the Sun. The bold opening statement is by design; the segue in the beginning is “meant to be a sort of passage from the beauty in City of the Sun into the much darker Contrapasso.” As the song proceeds, we get a dramatic, theatrical middle section not unlike something Vulture Industries might pull off, and then a melancholy, melodic build to the ending, which reprises a them from earlier in the song. All that is well and good, but I would caution any casual listener, or anyone who is being introduced to the band with this album, against judging the entirety of their sound by this track. It is excellent, but it is very much distinct from other songs. Second track ‘Heresy’ is a more rollicking number with higher-register vocals – I jotted in my notes at one point that the organ made me think of a jazzy version of Ghost – while ‘Inertia’ lunges forward with playfully fluid and subtle time signature shifts and sounds much more like a “traditional” Seven Impale piece. This one is Benjamin’s pick for a favorite, since it features some finished versions of riffs he wrote down in Guitar Pro more than five years ago. The payoff is satisfying for him as well as us, because this is one of my two favorites on the album as well; the chorus is addictive and the subdued, haunting bridge is exceptional in the way it allows all the band’s instruments to interact without being over-the-top. My other favorite is the subsequent track, ‘Languor’, which the band chose to release as their lead single. This piece grabs you by the throat with an almost sludgy, Phrygian rhythm on distorted bass. The sax plays at a different mode by using a sharp 4th momentarily, but once the full melody comes in on sax and choral keys it reveals itself as purely Phrygian. This was the first modal melody that really grabbed my attention, but with repeated listens, other scales pop out all over the album – Dorian on ‘Heresy’, Locrian on ‘Helix’, and certainly more I’m not keen enough to recognize. 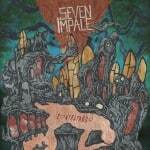 This melodic creativity prompted me to ask about how Seven Impale approaches composition. Benjamin told me that most of the counterpoint writing is spontaneous and improvised around a main riff, and there is a lot of jumping between major, minor, and other modes, with the relationship between seconds/fourths/sixths/sevenths and the root not always being fixed. “Phrygian can very quickly be very Opeth-y”, he states, and as I read that and listen to around the 5-6 minute mark of ‘Languor’, I can hear the parallel perfectly. A dash of Opeth-iness never hurt anyone, I always say! The band’s maturation as songcrafters exudes from every pore of this album. Each track is richly layered and accented with instruments and vocal passages, unexpected yet perfectly-flowing dynamic twists, and smooth transitions between disparate musical ideas. While there are six instrumentalists vying for the listener’s attention, they are incredibly well-balanced and frequently pared down so that only two or three are driving the song at any given time. The wide variety of sounds comes from an even wider variety of influences, from critical darlings Snarky Puppy and Tigran Hamasyan, to the cerebral metal of Meshuggah and Shining, to Frank Zappa and a handful of others I can’t even categorize because they’re so far outside my wheelhouse (Hiatus Kaiyote, Nik Bärtsch’s Ronin, Sleep Party People, Elephant9, and “basically everything involving Mark Guiliana” were a few of the artists offered by Benjamin). Benjamin made a point of crediting producer Iver Sandøy specifically for his aid in helping them explore new vocal territory, incorporating vocals from almost all the members onto several of the tracks (‘Heresy’, ‘Inertia’, ‘Convulsion’, and ‘Helix’ have vocal contributions from the larger group). But even when it’s just main vocalist Stian, the terrain he covers is surprisingly diverse and all well-executed. After the gentle interlude of ‘Ascension’, ‘Convulsion’ kicks in with one of the album’s most concentrated bursts of energy, featuring distorted guitar and bass and a sort of spaced-out yelling for the vocal style. ‘Helix’ follows with a strange melody that almost sounds like a synthesized dial tone, and progresses into a brooding, claustrophobic churner. Around halfway through, distortion and waves of synth crank things up and set the stage for perhaps the most abrasive vocals on the album. After this climax, a denouement comes rooted in interplay between bass and keys, again with subtle layers of everything else fleshing out the sound. This song was drummer Fredrik Widerøe’s pick for favorite, as he highlighted its “very unconventional structure”, saying it was “very different from everything we’ve ever made”, and that it exemplified the kind of “progress” that should be expected of modern progressive bands. The second-to-last track, ‘Serpentstone’, opens with a heavy riff that is relatively happy-sounding compared to much of the rest of the album. Around the 1:45 mark, the melody shifts to a root – 2 – ♭3 – ♭2 pattern that is not unique but most immediately calls to my mind the song ’20 Minutes/40 Years’ by Isis. Benjamin gets a nice sax solo in the middle of this contemplative piece. This song, for whatever reason, stands out as a bit more lyric-driven. According to Benjamin, there is a loose “thread” that governs the lyrical themes on both City of the Sun and Contrapasso, having to do with a “‘utopian’ universe” – on the new album, things revolve around “false prophets” causing this perfect society to crumble by essentially attracting cult followings, and the “downfall and ‘resurrection’ of the city and its people.” This fits sensibly with the somewhat hopeful-sounding quality of ‘Serpentstone’, which is the last lyrical track on the album. One big piece of music it is, and regardless of whether you share my reservations about its finale, there is undeniably an enormous amount of high-quality material to ruminate on here. I loved City of the Sun, and I have a hard time weighing the two albums against each other to pick a favorite. Someday, when I revise my personal spreadsheet of the best albums of all time, I will have to make that call. Today, I don’t have to, and instead I can just offer a full-throated endorsement of both albums. If you were a fan of Seven Impale already, this album should tingle all your senses in ways you never even saw coming. And if you weren’t, then good news – you have two incredible albums to check out. Stop dilly-dallying and get to it. 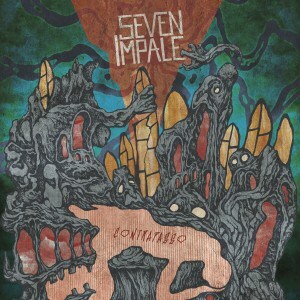 There was already nothing out there like Seven Impale, and with Contrapasso they’ve gone and made themselves even more unique. A promotional copy of the album was used for this review. On	September 7 2016, this entry was posted. ← Mini-Reviews XIII: Double Trouble!! !